Drag & Drop the Hujes to build a tower and reach the red dotted line above. Hujes are sleeping touch them to wake them up. The black Hujes will weigh the rest down, which is what you might need to wake up more Hujes to build a tower. Connect to the wheels in Huje Tower to roll to the top of the hill to reach the line. 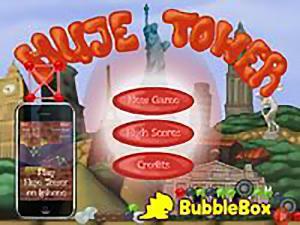 Keep playing Huje Tower because it gets more and more challenging. . .